I just wanted to say hello to the Obscure Analyst family. Some of you have decided to join my wallstreetforensics.com family and have signed up for my weekly Forensics Newsletter and I just wanted to thank you for the opportunity you have given me to share my investment research with on a regular basis. I wanted to let everyone know that my first 4 weeks at PTT Research have gone extremely well and the response so far to my Forensics Newsletter product offering has been tremendous. The knowledge sharing between the PTT Research analysts makes it easier for me to do my job well and will continue to give me even more insight into my favorite investments. Some other exciting news is that PTT Research is in the process of developing my own WallStreetForensics.com App for mobile devices, which will allow my subscribers to view content and interact with each other through the PTT Forensics member forum from their mobile devices. My inaugural PTT Research investment pick was up nearly 20% at its peak in just 3 weeks since I announced it to my Forensics Newsletter subscribers on June 5th and is still up well over 10% today. I’ve provided subsequent updates to my subscribers regarding my inaugural investment pick as well as continued updates related to my other favorite investments. I’ve also made some solid progress towards announcing my next investment pick to my paid subscribers. Once my deep research is complete on my next investment pick it will go through my rigid evaluation process for approval before it can qualify as my next investment pick for my subscribers. My goal is to share my research and analysis with my subscribers and present them with investment options that they can put their money behind, follow the story and watch their investments grow over time with significantly less inherent risk. My subscribers receive the latest trends and information on my favorite investments including breaking news headlines that have not been written that they will receive weeks to months ahead of the general public so they can profit from it. There is still plenty of time to get into the action but the window is closing quickly before my inaugural pick along with my very detailed analysis and strong buy recommendation is presented to the general public and my next investment is presented to my paid subscribers for the very first time. I have also discovered some amazing new developments that even surprised me related to some of favorite investments. If you have an investment in GTAT and have not thought long and hard about buying a Forensics Newsletter subscription you have missed and will continue to miss invaluable real-time information related to GT Advanced Technologies that you can profit from. While the rest of the world waits for the iPhone 6 to arrive I have been hard at work researching, listing and writing about the next several significant developments that will be making headlines for GT Advanced Technologies as well as my “locked” up inaugural PTT Forensics investment pick. Are you curious what you are missing? My Forensics Newsletter is currently being offered at a 10% discount for as long as you keep you subscription active. Thanks again for your continued support and I hope to see more members of the Obscure Analyst family join me over at PTT Research in the near future to finish the ride we have started and to join me on several new investment journeys for years to come. Some Cold Hard Facts: My individual portfolio of stocks is up 400% since the beginning of 2013. Over each of the last 18 months my portfolio has returned a positive return 89% of the time. That means my portfolio of stocks provided a positive monthly return 16 out of the last 18 months! My last stock pick is up over 10% in just over three weeks since I made the pick public to my paid subscribers. It’s not too late to get in on the fun as well as the latest headline grabbing scoop on my favorite investments and enjoy 10% off your subscription. Complete story via WALLSTREETForensics. This breakdown was provided to paid subscribers before Micron’s big move today. My individual portfolio of stocks is up 397% since the beginning of 2013. Over each of the last 17 months my portfolio has returned a positive return 88% of the time. That means my portfolio of stocks provided a positive monthly return 15 out of the last 17 months! My last stock pick is up over 10% in just over two weeks since I made the pick public to my paid subscribers. It’s not too late to get in on the fun and enjoy 10% off your subscription, sign up today! Raymond James upped its price target from $30 to $40 late yesterday. The analyst at Raymond Jones is seeing continued tight supply and demand for Micron’s products. The firm maintains GAP EPS estimates of $2.20 in 2014 and $2.85 in 2015. Baird joins the growing list of firms that, who recently raised price targets on shares of Micron. Over the last week Bank of America raised it’s Micron PT to $40, Credit Suisse raised its PT to $50, Baird raised its target to $42 and Nomura raised its PT to $40. Disclosure: I am long shares of Micron and maintain a $61 price target that was issued in April. Get in early before the rest of my market catches up to my early “buy” calls on stocks. My individual portfolio of stocks is up over 397% since the beginning of 2013. Over each of the last 17 months my portfolio has returned a positive return 88% of the time. That means my portfolio of stocks provided a positive monthly return 15 out of the last 17 months! My last stock pick is up 10% in just over a week since I made the pick public to my paid subscribers. It’s not too late to get in on the fun, sign up today! Significant new developments related to GTAT’s sapphire operations will be revealed via WALLSTREETforensics within the next hour. My individual portfolio of stocks is up 397% since the beginning of 2013. Over each of the last 17 months my portfolio has returned a positive return 88% of the time. That means my portfolio of stocks provided a positive monthly return 15 out of the last 17 months! My last stock pick is up 10% in just over a week since I made the pick public to my paid subscribers. It’s not too late to get in on the fun and enjoy 10% off your subscription, sign up today! Baird upped its rating to outperform on shares of Micron and upped its price target from $25 to $42 today. The analyst at Baird is seeing continued improvement in DRAM supply and demand trends. Baird joins the growing list of firms that, who recently raised price targets on shares of Micron. Last Wednesday, Bank of America raised it’s Micron PT to $40 and Credit Suisse raised its PT to $50 and on Friday Nomura raised its PT to $40. Disclosure: I am long shares of Micron and maintain a $61 price target that was issued in April. My individual portfolio of stocks is up 397% since the beginning of 2013. Over each of the last 17 months my portfolio has returned a positive return 88% of the time. That means my portfolio of stocks provided a positive monthly return 15 out of the last 17 months! My last stock pick is up 10% in just over a week since I made the pick public to my paid subscribers. It’s not too late to get in on the fun, sign up today! Professional leaker Sonny Dickson is back at it again. Dickson just released his official photo of Apple’s 4.7″ and 5.5″ iPhone 6 hours ago. In 2013 Dickson released his official photos of the iPhone 5s and 5c just a few weeks prior to Apple’s official launch date in September. 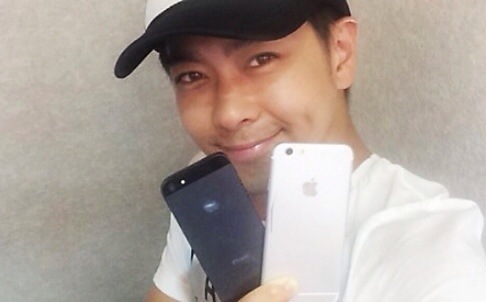 Earlier this week Taiwanese celebrity Jimmy Lin showed up in the news for another annual iPhone photo leak back. 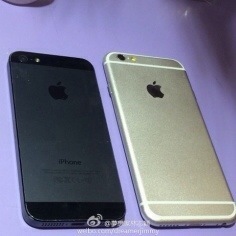 Lin this time around is reportedly leaking images of the iPhone 6. Jimmy Lin most notably leaked accurate images of the iPhone 5c in 2013 in mid August, which was one month before the 5c officially launched. The pace of iPhone 6 photo leaks has picked up steam over the last week. Do the recent leaks indicate that the iPhone 6 launch is just the around the corner? If recent history provides any sort of track record the iPhone 6 launch might be just around the corner. Looking to profit from the iPhone 6 launch as well as the latest trends in technology? Check out my in-depth coverage on my top investment picks at PTT Research Forensics Newsletter and be the first to know my next move before everyone else! Taiwanese celebrity Jimmy Lin is back at it again. This time around he is reportedly leaking images of the iPhone 6. Jimmy Lin most notably leaked accurate images of the iPhone 5c in 2013 in mid August, which was one month before the 5c officially launched. 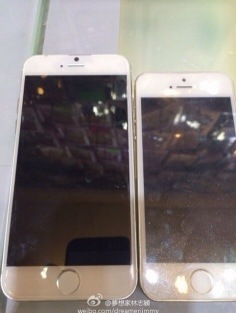 The images show what is being touted as the iPhone 6 alongside the iPhone 5S. Looking to profit from the latest trends in technology? Check out my in-depth coverage on my top investment picks at PTT Research Forensics Newsletter and be the first to know my next move before everyone else! Earlier today, Nomura maintained its buy rating on shares of Micron and upped its price target on shares of Micron from $30 to $40. Nomura joined other firms, who recently raised price targets on shares of Micron. On Wednesday, Bank of America raised it’s Micron PT to $40 and Credit Suisse raised its PT to $50. For in-depth coverage on my top picks check out my PTT Research Forensics Newsletter and be the first to know my next move! The project win with Qatar Solar Energy (QSE) is subject to QSE’s receipt of government approvals and financing before the project win becomes in an offical equipment order. As far as revenue recognition, HiCz will likely have a longer period of acceptance that could range from 6 to 12 months after the equipment is delivered before revenue can be recognized. MERRIMACK, N.H., June 12, 2014 (GLOBE NEWSWIRE) — GT Advanced Technologies Inc., (Nasdaq:GTAT), today announced that it has secured a project win for its proprietary, next-generation HiCz continuous feeding puller technology that is expected to help enable the solar industry’s transition to higher efficiency, lower cost solar material. The company has entered into an agreement with Qatar Solar Energy (QSE) to supply its HiCz™200 furnaces for QSE’s integrated PV manufacturing project in Doha, Qatar. As noted by QSE in a recent press release, QSE has opened a 300MW integrated facility and plans for the project to reach 2.5GW. The supply agreement is subject to QSE’s receipt of government approvals and financing, at which time GT would expect to receive the equipment order. HiCz is GT’s proprietary next-generation monocrystalline PV puller capable of growing both p-type and n-type monocrystalline ingots. The HiCz continuous feeding growth process offers significant advantages over traditional batch Cz furnaces making it particularly well suited for the production of n-type ingots. The HiCz growth process produces longer ingots with greater material uniformity and lower resistivity. This process lowers the cost of wafering through improvements in yield, enables higher quality material and is expected to provide a path to higher efficiency solar cells. I will be breaking down the financial impact of this deal for my PTT Forensics Research Subscribers in the near future. Join now and be the first to find out!